I have never suggested that I, Jonathan Whitcomb, am a paleontologist, although I know more about pterosaur fossils than the average person on the street. I am an expert on reports of apparent living pterosaurs, commonly called pterodactyls by the eyewitnesses. In other words, I am a cryptozoologist. I often use the word “apparent” when referring to a particular sighting, for I am a scientist, and I recognize the limitations in using an individual eyewitness report. I’ve analyzed, using simple mathematics, a number of characteristics in the overall sightings, and have disproved hoax conjectures. Several factors have independently counted against the possibility that any hoaxes have played any significant role in the sighting reports, and the combination of those points has eliminated that possibility. I’ve received emails from eyewitnesses from five continents plus islands in the Pacific, emails about flying creatures that resemble “primitive” or “prehistoric” animals more than any bird or bat. On occasion I am able to talk with an eyewitness by phone or by face-to-face interview. One critical point here, unappreciated by some paleontologists, is that those eyewitnesses come from various countries and have different backgrounds and beliefs, including differing religious beliefs. Why is that critical? Significant similarities in the descriptions include featherless appearances, a cone-like appendage at the back of the head, and a long tail that ends in a structure suggesting a Rhamphorhynchoid tail flange (sometimes described with a “diamond”shape at tail-end on the living flying creature observed) and some paleontologists have dismissed reports of living pterosaurs by referring to the religious beliefs of those involved or have simplistically rejected overall sightings as misidentification of birds or bats. What about the fossil experts, in particular those paleontologists who ridicule the possibility of modern pterosaurs? They know about individual creatures that have died, those few rare individuals that left evidence of their existence in fossils. That’s what paleontology is about. So how much do those few critics know about eyewitness reports? Very little, it seems. 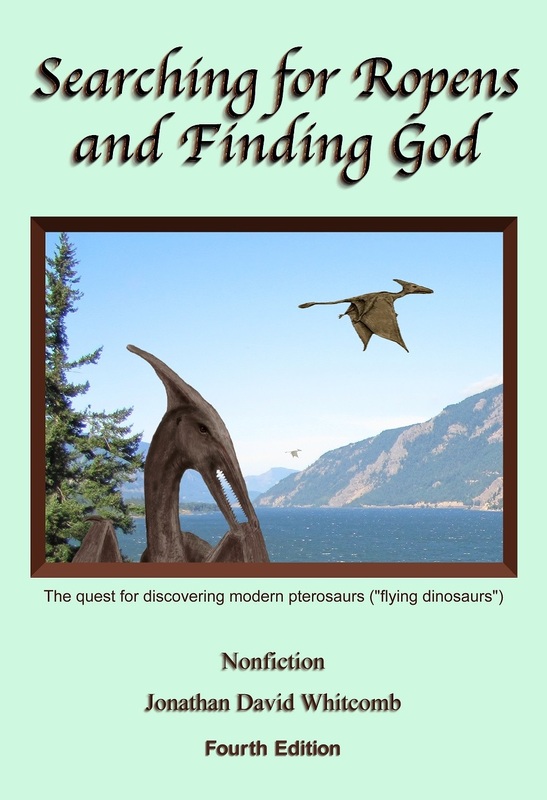 Some like to generalize and imagine misidentification of common birds and bats; rare is the paleontologist who even acknowledges a particular sighting, a real encounter with some flying creature. Consider the words of a paleontologist who participated in an expedition for Monsterquest. He explained his opinion, why a pterosaur is not likely still living: “It flies; they would have been seen by lots of people.” Well, if only 1% of the encounters gave some kind of impression of a pterosaur or dragon appearance, that’s 70,000 persons: “lots of people” indeed, in my opinion. I extol the participation of my friend and associate Garth Guessman, in his part in the Monsterquest expedition; he believes in the reality of living pterosaurs in Papua New Guinea and elsewhere, as I do. But that paleontologist hardly seems like an ideal person to take on a search for an extant pterosaur.
. . . but paleontologists, those thought to be the greatest experts on pterosaur fossils—they consider it almost impossible for one of those species to be alive, and the key point is “almost.” I have learned that critical detail from communicating with a few paleontologists and from reading what a few of them think about reports of modern pterosaurs. I have also seen the results of a survey of biology professors from some of the largest universities in the western United States. Of the few that responded to the questionnaire, the probability of a species of living pterosaur was put at 0% to 5%, with an average of 1.5%. Half of those professors who responded believed it was very unlikely but possible. In other words, not all paleontologists and biology professors are completely convinced that all species of pterosaurs must have become extinct. That is far from what some critics and skeptics have said in deriding the work of those of us who still hope for a wonderful scientific discovery. Please keep up your hope in a discovery, for we keep looking and we keep interviewing eyewitnesses. 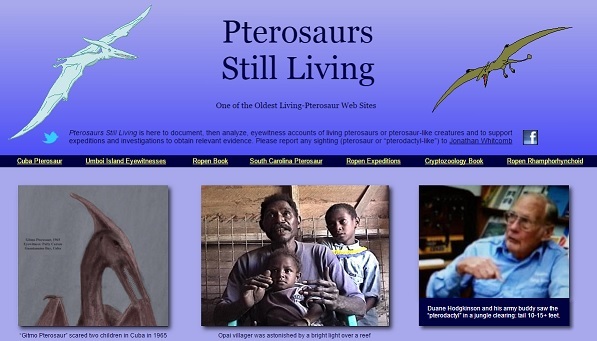 Over a period of fourteen years, I have spent over 10,000 hours in researching, interviewing, writing, and searching in relation to the narrow field of cryptozoology that we call “living pterosaurs.” In itself, that time does not prove anything about my objectiveness. It does suggest, however, that I may have acquired knowledge that is worth looking into, for any cryptozoology who wants to learn what my associates and I have discovered, over many years, from eyewitness accounts. As of the end of 2017, I have published four books about living pterosaurs, in a total of nine editions. I have also published over a thousand web pages, including news releases and blog posts, on this subject. I have also been interviewed for two television shows and a number of radio talk shows and podcasts, for a number of countries, including the United States. In addition, I was consulted by both Destination Truth and Monsterquest (TV adventure shows) before their expeditions in Papua New Guinea, in relation to searching for flying creatures that my associates and I believe are extant pterosaurs. The title is “Jonathan Whitcomb: Pterodactyl Expert,” although the one that appears guilty of libel spells it . . . I don’t mean to imply that everything on this forum thread is without merit. But all commentators except the one initiating the discussion appear to me to practice bulverism rather than comment on any specific sentence that I have written. Does a live pterodactyl fly over villages of some southwest Pacific islands? Many testimonies suggest nocturnal long-tailed creatures (called “Rhamphorhynchoids” by some) having names like “ropen” and “duwas” (Don’t confuse with “duah,” a Western mistake), live in coastal areas of the mainland of Papua New Guinea, as well as on the islands of Umboi and Manus. I was delighted with the two hour interview I had with the two hosts of the Monster X Radio online broadcast: “Johnny Bigfoot” and Shane Corson. We did not get into any details about the Marfa Lights of Texas, but we did discuss the bioluminescent-pterosaur concept, and Susan Wooten mentioned her experiences watching the Bingham Lights of South Carolina. ← Ropen-Pterosaur in Oregon and Washington?